Jennifer Popik, J.D., director of federal legislation for National Right to Life, stressed the need for the Born-Alive Abortion Survivor Protection Act during a press conference on the Hill. This morning, Rep. Ann Wagner (R-Mo.) and five of her pro-life House colleagues held a press conference to condemn Senate Democrats for failing to advance the Born-Alive Abortion Survivors Protection Act (S. 311), sponsored by Sen. Ben Sasse (R-Neb.). The final vote was 53-44 with all but three Democrats voting to block the bill from receiving the 60 votes necessary to move S.311 forward (“invoke cloture”). The bill would extend federal legal protection to babies who are born alive during an abortion. In the House, Democrats have erected a procedural hurtle which prevents a similar bill from being heard. Along with her colleagues, Wagner urged House members to sign onto a “discharge petition” to force the same legislation to a vote on the floor of the House. A discharge petition is a procedural tactic to circumvent the Speaker of the House when the Speaker opposes a measure. It allows an absolute majority of the House (218 lawmakers) to force a floor vote on a bill, even if pro-abortion leaders oppose the measure. Rep. Wagner was joined by Whip Steve Scalise (R-La. ), Rep. Jackie Walorski (R-Ind. ), Rep. Chris Smith (R-NJ), Rep. Roger Marshall (R-KS), Rep. Michael Burgess (R-Tx. ), and several prolife organizations who all made remarks. The members were united in expressing shock over the 44 members of the United States Senate who voted to protect what amounts to infanticide: willfully withholding life-saving care from a born-alive infant. 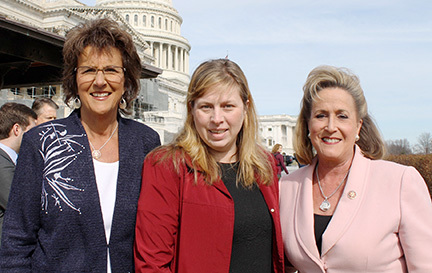 Center: Jennifer Popik, NRL director of federal legislation, flanked by pro-life Congresswomen Jacki Walorski (IN) and Ann Wagner (MO), lead sponsor of the Born-Alive legislation. Action on the Born-Alive Abortion Survivors Protection Act comes on the heels of enormous controversy in New York and Virginia. In January, the New York legislature passed, and Gov. Andrew Cuomo (D) signed, the so-called “Reproductive Health Act.” Among other provisions, the law repealed protections for infants born alive during an attempted abortion. Previously, New York law stipulated that a second physician be present to care for a child 20 weeks or older born alive during an abortion. In Virginia, Gov. Ralph Northam (D) waded into the debate over a New York-style measure in the Commonwealth. In a radio interview during the Virginia legislature’s debate over the “repeal bill,” Northam said an infant born alive during an attempted abortion wouldn’t necessarily be entitled to immediate treatment other than being made “comfortable.” His comments touched off a torrent of criticism. You have to ask yourself, can we really trust the abortionist, who was seconds earlier, was attempting to end this life of this baby, to now provide treatment? We need clear standards of medical care for babies born-alive. That is why we need this enhanced version of the Born-Alive legislation. We are appalled that pro-abortion Democratic senators would filibuster the Born-Alive Abortion Survivors Protection Act. They need to explain to their constituents why their allegiance to the abortion industry agenda should allow a practice that is tantamount to infanticide. We call on all members of the House to sign the discharge petition and bring this bill to the floor for a vote. Let the American public see how much they truly care for the most vulnerable among us. Documentation on the history of the Born-Alive Infants Protection Act of 2002 (1 U.S.C. §8) and related issues is available on the NRLC website at: www.nrlc.org/federal/bornaliveinfants.